We source quality products and materials that are fit-for-purpose to ensure your new home or renovation has the highest level of corrosion protection and durability. All our structural steel is hot dip galvanised using a zinc coating to protect it from the atmosphere and corrosion. Galvanised steel is widely used in applications where corrosion resistance is needed without the cost of stainless steel. We also offer the option of applying an additional 2 x coats of two-part epoxy and 1 x coat of polyurethane prior to installation for 100% coverage and to provide a tough, protective barrier. These extra preparation steps are not required under the Building Code of Australia for steelwork, however, we prefer to employ these extra measures for added protection. When applying the external cladding of your home, and prior to be painted, we use stainless steel screws and nails coated with Penetrol. All corners are then sealed using Sikaflex Pro to prevent moisture penetration. 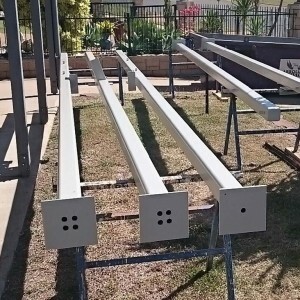 Using coated stainless steel fixings guarantees their rust-resistance when exposed to the often harsh weather conditions of Central Queensland. No more rusting nails and unsightly rust spots on your external cladding, which will save you on costs to repair your cladding or to repaint your house later down the track. Timber is used extensively today in housing for external cladding, decks, verandahs, stairs and external features, and provides an attractive and practical choice for home owners. We source and select natural timber products that are fit-for-purpose in our region where lots of sun, salt, rain and the odd cyclone can wreak havoc on your home. We choose only top quality Class 1 durability-rated natural hardwood, such as spotted gum and merbau, over engineered timber products, to ensure the lifespan of your timber structures. Find out more about Our Methods and Our Management.